The Adventurous Lectionary, Lent 2, Bruce Epperly, Living a Holy Adventure, 2019. "Journey Toward Trust," Sermon Seeds, etc, Kathryn M. Matthews, 2019. "From Threat to Lament," D Mark Davis, raw translation and exegesis/questions, Left Behind and Loving It, 2013. The Lectionary Lab, Lent 2C, the Rev'ds Dr. John Fairless and Delmer Chilton (aka "Two Bubbas and a Bible"), 2013. Lectionary Lab Live podcast. Girardian Reflections on the Lectionary, Lent 2, by Paul Nuechterlein & Friends. Rumors, for February 28, 2010, Ralph Milton, "Sermon helps for preachers with a sense of humor." Sermon Brainwave, Lectionary podcast featuring Profs. Rolf Jacobson, Karoline Lewis, and Matt Skinner, discussing the week's passages in light of current events. At Luther Seminary's WorkingPreacher.org. 2019. "Identity Test," Karoline Lewis, Dear Working Preacher, 2019. "Courage and Vulnerability," David Lose, ...in the meantime, 2016. "Love and Belonging," Karoline Lewis, Working Preacher, 2016. "Herod Wants to Kill You," Dan Clendenin, Journey with Jesus, 2016. "Our Lord's Lament," Glenn Monson, Law & Gospel Everywhere, 2016. "The Politics of the Dangerous City," Mark Davis, Political Theology Today, 2016. "Lenten Reflection on a Life Verse," Steve Godfrey, Church in the World, 2016. "On Being Political," Thomas Beam, 2016. "The Money Lie: Consumerism's Empty Promise," Adam Copeland, ON Scripture, 2016. Discussion questions, video. "The House that Is Left to You," Journey to Penuel, 2016. "Not Too Late," Janet H. Hunt, Dancing with the Word, 2016. "Lament over Jerusalem," Suzanne Guthrie, At the Edge of the Enclosure, 2016. "Get the Picture?" Lynn Miller, celebrating our creative and living God by generating art and architecture resources for congregations and individuals. Art and Faith Matters facebook page contains additional resources. "A Time to Weep," Bob Cornwall, Ponderings on a Faith Journey, 2016. "The Darkness Deepens: the Fearsome Sleep and Fire Pots," Anna Shirey, The Labyrinth Way, 2016. "A Fierce Refuge," Sermon-Stories, 2016. "Jesus Telling It LIke It Is," Modern Metanoia, 2016. "Witnessing God's Face," Larry Patten, 2016. Today, ,Tomorrow, and the Third Day, Andrew King, A Poetic Kind of Place, 2016. "The Big Delay," Lectionary Poetry, Scott Barton, 2016. "Radical Faith in New Possibilities," Lent 2C, guest essay by Edwina Gateley, The Journey with Jesus: Notes to Myself, Daniel B. Clendenin, Journey with Jesus Foundation, 2013. 2010 guest essay by Pam Fickenscher. 2007 essay by Daniel Clendenin. "We'll Walk Hand in Hand?" Rev. Stephanie Buckhanon Crowder, PhD, ON Scripture, Odyssey Networks, 2013. "Fear, Faith, and Where We Belong," Sharron R. Blezard, Stewardship of Life, 2013. "Re-Imagining God," David Lose, Dear Working Preacher, 2013. "Deep and Terrifying Darkness in Which Covenant Comes," Michael Coffey, 2013. 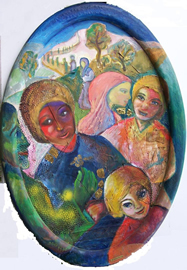 "Becoming Citizens of Heaven," Robert Cornwall, Ponderings on a Faith Journey, 2013. "Proud Jerusalem and Christ's Wings," Katie Munnik, Presbyterian Record, 2013. "Painful Path, Strong Faith," Alyce M McKenzie, Edgy Exegesis, 2013. "How Often," Rick Morley, 2013. "Our Citizenship in Heaven," "Why a Chicken?" the Rev. Dr. Janet H. Hunt, Dancing with the Word, 2013. "Where Are You Looking? What Do You See?" Bruce Maples, brucewriter.com, 2013. "A Better Prayer," Steve Goodier, Life Support System, 2013. "Keeping the Promise," Christopher Burkett, PreacherRhetorica, 2013. "Size of a Hen," Neil Chappell, aweirdthing, 2013. "Tiger's Sins and Ours," Debra Dean Murphy, Intersections, 2010. "Enduring Desire," Doug Lee, The Ekklesia Project, 2010. "That's Why They Call It the Blues," Peter Woods, I Am Listening, 2010. Dylan's Lectionary Blog, Lent 2C, 2007. Biblical Scholar Sarah Dylan Breuer looks at readings for the coming Sunday in the lectionary of the Episcopal Church. "Your Prophetic Voice," Christopher Girata, Day1, 2016. "Jesus on the Move," by Jim Somerville. A Sermon for Every Sunday: video sermons for every Sunday of the Christian Year. "Loving Like a Mother Hen," Danae Ashley, Episcopal Digital Network, 2016. "The Fox Is in the Henhouse," the Rev. Joseph Evans, Day 1, 2013. "Allowing the Lord to Lead Us Through Lent," Rev. Ben E. Helmer, Sermons that Work, Episcopal Digital Network, 2013. 2 Cuasesma (C), por el Rvdo. C. Jesus Reyes, Sermones que Iluminan, 2013. "Sermon for the 1st Sunday in Lent," Mr. Dayton Edmonds, Day 1, 2001. "Journey toward Trust," Weekly Seeds, UCC, 2019. Mustard Seeds, "Risking Everything / God's Wings/Shelter," Lent 2, 2016. A lectionary-based ideas resource for leaders of contemporary worship, Ann Scull, Gippsland, Australia. Worship Resources, Lent 2C, Rev. Mindi, Rev-o-lution, 2016. LCA Worship Planning Page, Lent 2C, "Everything lay-readers need to prepare worship." Lectionary Liturgies, Lent 2C, 2016, Thom M. Shuman, Presbyterian Church (U.S.A.). Worship and Liturgy Resources, Lent 2 - Harvest/Thanksgiving, by Rev David Beswick, Uniting Church in Australia. Lector's Notes, Lent 2, Gregory Warnusz, Saint Jerome Parish, Bellefontaine Neighbors, MO. Notes and commentary for those reading this week's lectionary texts to the congregation. "Liturgy: prayer reflection": Transfiguration option, CofE Common Worship, reflections on the collect at the Eucharist, Rev. Bosco Peters, New Zealand. "Service Prayers for Lent 2," Worship Ways, UCC, 2013. The Timeless Psalms: Psalm 27, Lent 2C, Joan Stott, prayers and meditations based on lectionary Psalms, 2016. "Lament over Jerusalem," Suzanne Guthrie, Soulwork toward Sunday: At the Edge of the Enclosure, 2013. "Our True Home," Dan Schifeling, Worshipcalls, 2013. Prayer for Lent 2C, RevGalBlogPals, 2013. Weekly Evangelectionary, Jonathan Shively, Evangelism Connections, 2013. HermanoLeón Clipart, Lent 2 (Roman Catholic - Transfiguration text). Free clipart, backgrounds, slides, etc. Clip Art, Lent 2C, Fr. Richard Lonsdale, Resources for Catholic Educators. Clip Art Images: Luke 9:28-36, Luke 9:28-36 #2, Genesis 15:5-12, 17-18, Misioneros Del Sagrado Corazón en el Perú. "Magic Towel/Tweety Bird," video, John Stevens, Dollar Store Children's Sermons, 2016. "Changing Systems," Faith Element Discipleship System, "Setting the Bible Free," 2013. "We're Citizens of Heaven," Text: Carolyn Winfrey Gillette, Tune: ANGEL'S STORY 7.6.7.6 D ("O Jesus, I Have Promised"), A new hymn based on Philippians 3:17-4:1 was written for The Presbyterian Outlook magazine for Lent 2013 and available with the music. Hymns of the Spirit Three, Lent 2C, Richard E. Hurst, Universalist National Memorial Church. Psalm Settings by Dale A. Schoening, Metrical Psalms, Psalm 27 set to Assurance (9 10 99 99 99). "Since the Lord is My Salvation" Text: Carolyn Winfrey Gillette, Tune: NETTLETON 8.7.8.7 D ("Come, Thou Fount of Every Blessing") A new hymn based on Philippians 3:17-4:1, Psalm 27 and Luke 13:31-35 was written for The Presbyterian Outlook magazine for Lent 2016 and available with the music. Hymn and Song Suggestions, Lent 2, 2016, annotated suggestions from Natalie Sims, Singing from the Lectionary. The Billabong, Lent 2, by Rev Jeff Shrowder, Uniting Church in Australia: Hymn suggestions and paraphrases of lectionary Psalms. Worship Resource Manual, The Moravian Church, Southern Province. Worksheets for planning music in worship: hymns, anthems, solos, organ repertoire suggestions for RCL texts. Direct link to Lent 2. Choral Anthem Project, Lent 2C, National Association of Pastoral Musicians. Lectionary Hymns, Lent 2C, National Association of Pastoral Musicians. Sing for Joy, Lent 2C, 2007. Choral reflections on this week's lectionary readings, St. Olaf College. "There's a Prayer for That: Whom Shall I Fear?" On the Chancel Steps, children's resources by Frances Woodruff, 2013. Little People, Big Word, Lent 2C, D. Ditmer, 2013. Story for Children's Worship and Family Activity, Lent 2C, at word-sunday.com: A Catholic Resource for the Lectionary by Larry Broding. Ministry Matters, February 24, 2013.